I spent most of the working day today [2 September 2014] in the university quarter of Belfast at a joint meeting of the faculties of the Church of Ireland Theological College and Edgehill Theological College. It is always a positive learning experience to meet and share with staff of another theological college. But sometimes contacts with other universities and colleges can come about in the most unexpected and unusual ways. While I was on holidays in Greece last week, an email arrived at work from Theo Snudden, the President and Men’s Captain of the Jesus College Boat Club, Cambridge. The club is launching a new appeal in its search for a company that can commit to supporting JCBC with a sponsorship of £9,500 a year over a four-year period. A new brochure is being produced as part of this appeal, and could the club wanted to use a photograph of the I had taken last year of the boathouse and that I used in a blog posting about a walk along the banks of the River Cam by the boathouses in July 2013. Although I am reluctant to have my photographs used for commercial purposes or on commercial websites, I am very happy to have my photograph used in a fundraising effort like this. 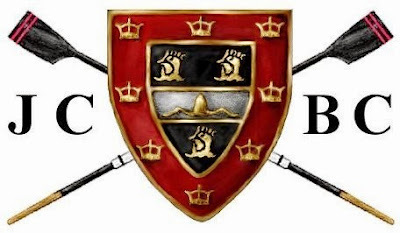 The club was founded in 1827, and has steadily built its strength and success, so that JCBC has a long-standing record of accomplishments, including some of the highest honours both in Cambridge and with years of college headships, and nationally with wins at Henley Royal Regatta and the Tideway Head of the River. Jesus College Boat Club is a large club and often has more than ten boats competing in the May Bumps. Over the years, JCBC has been consistently successful with the 1st Men’s VIII never having dropped below 12th place in the May Bumps and 11th position in the Lent Bumps. Jesus men have been head of the Lent Bumps on 39 occasions, finishing Head on 159 days; and they have finished head of the May Bumps on 24 occasions, finishing Head on 98 days – which is more than any other boat club, although Jesus men have not been head in either event since 1974. In the women’s bumps, JCBC crews took the headship of the Lent Bumps in 1985, 1986 and 1987, and headship of the May Bumps in 1988, 1993, 1994, 2005 and 2007. During the inter-war years the club was coached by Steve Fairbairn, who gave his name to the Fairbairn Cup Races. In 1929, he donated the cup and the races have continued ever since in their current form, a long-distance headrace. This Fairbairn Cup Race has since become the biggest event on the River Cam during the first term of the year, and it is the only race of its scale to be organised by a Cambridge college. Over 200 rowers take part, with entries from all the Cambridge colleges, many Oxford colleges and local boat clubs and schools. The course has changed over years because of the closures for bridge repairs or extreme weather conditions. In 1990, Jesus Boathouse Flagpole became the start line, with the finish at the Little Bridge, 4.3 km downstream. Although the cup itself is not presented, the Fairbairn Cup title is awarded to the fastest finishing college men’s VIII. Sponsorship at £9,500 a year over a four-year period offers unique opportunities for a company or business unrivalled and unique promotional opportunities and the promise of an exciting relationship. But it also means the club can continue to offer the best facilities and enable novices to develop into the top level athletes required to sustain JCBC’s success into the future. Further information is available from Theo Snudden, JCBC President and Men’s Captain, Jesus College, Cambridge CB5 8BL. The speakers this year include: Professor Evert van der Zweerde, Radbound University, Nijmegen; Professor Artur Mrówczynski-Van Allen, Institute of Philosophy Edith Stein, ICSCO, Theological Institute Lumen Gentium, Granada; Dr Natalia Vaganova, Saint Tikhon’s Orthodox University, Moscow; Revd Professor Andrew Louth, University of Durham; Metropolitan Kallistos Ware, University Of Oxford and IOCS; Revd Professor Nikolaos Loudovikos, University Ecclesiastical Academy of Thessaloniki; the Revd Tikhon Vasilyev, University of Oxford; Dr Ruth Coates, University of Bristol; Dr Clemena Antonova, Institute for Human Sciences, Vienna; and Dr Christoph Schneider of the IOCS.